6 verbs: Ser, Estar, Tener, Vivir, Comer, & Tomar! Spanish Present Tense Verbs: Flash Cards, Quizzes, and I have Who has Games! 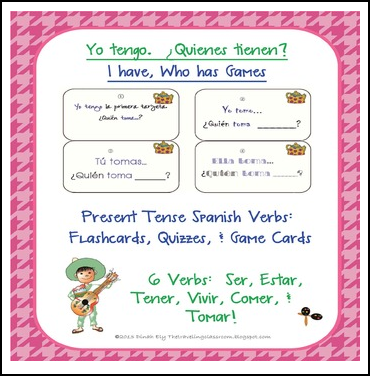 Spanish Verbs Demo: Flash Cards, Quizzes, and I have Who has Games! Please download this preview to view samples and get your freebies! This can be used to teach your students fluency in Spanish with these six Spanish verbs. Help your students learn to use these verbs properly and in their right context. Use this as a mini-course, review, or as an assessment tool! Please rate this product if you download it!